Brianna and I are learning quite a bit about some of the challenges Italian brewery's face in Italy. A deeply ingrained wine culture, spanning millennia, sees beer mainly as a simple and refreshing beverage. Breweries like Birra del Borgo are trying to change these attitudes by bringing Italian wine brilliance to Italian beer brilliance. They really are fascinating. It is quite the dichotomy, as Italians who really pride themselves on 'la dolce vita' by enjoying the food and beverage that comes with it seem to genuinely treat beer as a second class citizen. The passion of some of these brewers is often matched by despair as they explain to me the political and cultural issues they face in this industry. Alessio, Head brewer and owner of Croce Di Malto explained that his brother in law would never drink his beer, even when offered he would just ask for wine. This is a brewer who only two weeks ago won an award at the AIBA (Australian International Beer Awards). Crazy. We are lucky in Australia, brilliance is often accepted without question - on the flip side marketing often creates a sense of brilliance that unfortunately Australians also devour. With these challenges in mind, enter some very special Italian breweries, of which Birra del Borgo is flying the flag. I've labelled it the "Italian question", that is taking beer from just being great beer to being beer that is truly Italian. As a result the techniques, ingredients and processes used would turn a German pale. But to me, this is what makes beer special, and what can give a unique and identifying character to beer. I'm not sure how much these breweries work together by it seems they have their own ideas first and then collaborate. A really exciting time for Italy and craft beer in General. Pietro from Connibiolo seemed to share the same opinion but greeted such things with a little less gravity. 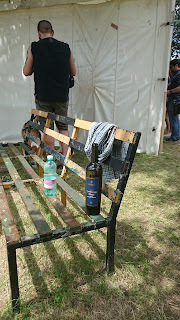 Wine... at a beer festival! Although a little tongue in cheek, the challenges are real and very different to the monopolisation and watering down of the currently exciting Australian beer market. We are always observant of what else is happening in the world of beer as these are tastes and trends, cultures and opinions that all deserve attention and have meaning. With that being said "cin cin" - hope to see you soon, glorious Italy!